This tutorial will review the process of installing Drupal through the Softaculous auto-installer. The process is simple and you can complete it with a few clicks. Log into your cPanel account and locate the Software/Services section. Then simply click on the Softaculous icon. Softaculous will display all of the applications available for a free installation. They are categorized by their functionality so you can find what you need easily. Now, for the purpose of this tutorial, let us choose the Drupal application, which is located within the "Portals/CMS" section. You will be presented with a Drupal overview, which includes information about the application, reviews, ratings and much more. You will also be able to test a live demo of the script, before you can choose to use it. Click on the Install button to proceed. Choose the version you want to install - Select a Drupal release that you wish to use on your website. For the purpose of this tutorial, we have used Drupal 7.26. Choose Protocol - You need to choose the protocol for your website. 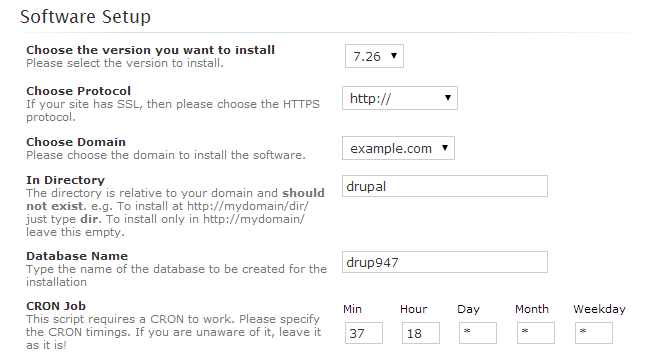 Choose Domain - The domain that you will be using for your new Drupal installation. This is usually the primary domain name of your account. However, if you have any addon or subdomains, they will be visible via the drop-down box here. In Directory - If you would like to install your Drupal website into a subfolder on your account, you can specify the name of the subfolder here. However, if you wish to install Drupal within the ROOT directory of your domain, leave the field blank. Database Name - Choose the name of the database to be set for the new installation. The new database will be automatically created with appropriate user and permissions. CRON Job - Set the interval for the Drupal cron job. Do not choose the https protocol if you do not have a valid SSL certificate installed on your domain by our support team. This is a paid service that you can get via your Client Area. Site Settings - Set the name and description for your new website. Database Settings - Set a prefix to be used for your Drupal database. 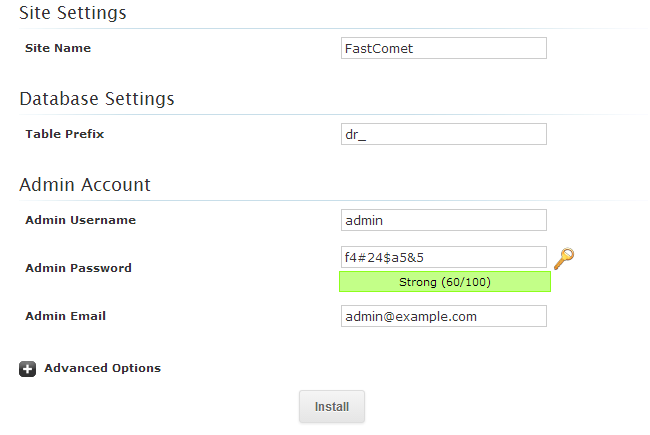 Admin Account - Set the details for the administrative user on your website. Make sure that you keep your details safe as you will be using them to edit and manage your new Drupal installation. When you are ready with all of the options that you can edit for the new Drupal installation, you can check them again for corrections. If you are happy with the setup, simply click on the Install button below and Softaculous will complete the rest for you. 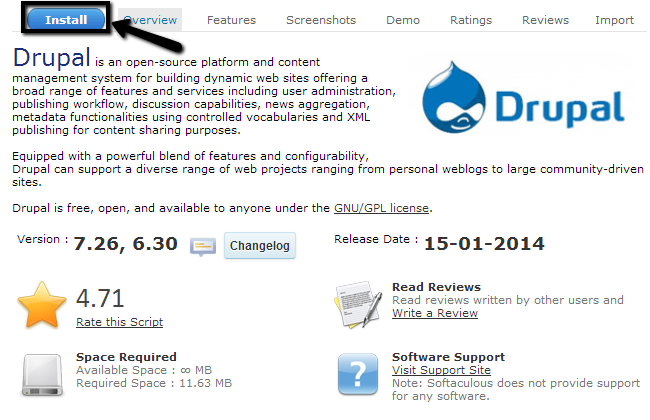 The new installation of Drupal is now completed. The system will display the main direct link to your website. Keep it safe as you will need it in the future.